The 21st Century leader is one who will be unable to hide behind a marketing faςade, thanks to social media. This means that today’s leaders must be able to master the art of comprehending cultural preferences while practicing “interpretive ambivalence” – the ability to see an issue as both a challenge to overcome and an opportunity to seize. 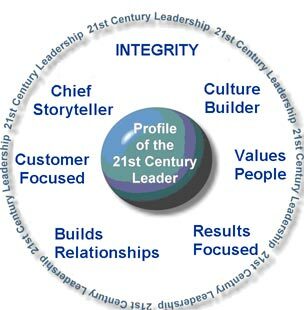 The 21st Century leader’s challenge is to lead with integrity. Integrity is where Beliefs, Words, & Actions overlap. It creates a positive social & work dynamic, thereby increasing morale, productivity, and revenue in a work environment. A person who is nice to you but rude to the waiter is not a nice person. (This rule never fails). Watch out for people who have a situational value system, who can turn the charm on and off depending on the status of the person they are interacting with. Be especially wary of those who are rude to people perceived to be in subordinate roles. We sell people and that’s what we need to be successful—people who are happy, respectful, and want to do the job every day. That’s what we nurture. It’s a never-ending balance in a competitive atmosphere. I tell young associates what goes around comes around, and keeping that in mind is not a bad way to conduct yourself. I am a fan of treating people right. I learned to listen by having only one objective: comprehension. I was only trying to understand what the person was trying to convey to me. I wasn’t listening to critique or object or convince. The key is to balance decisiveness with compassion. You can’t get the best out of people if your corporate values do not match the way they would live at home. I want people to feel comfortable to speak their minds if they think something isn’t right. Observation is one form of active listening. Actions sometimes speak louder than words. Keep your eyes and ears open. Rossina Gil, MSOD, is a Leadership and Organization Development Practitioner, cultural analyst, coach, and facilitator. CorporateLookingGlass.com. Kelly, Karen; Peter Shankman. Nice Companies Finish First. New York, NY: St. Martin’s Press LLC, 2013. King, W.J. Unwritten Laws of Engineering (Bill Swanson. Swanson’s Unwritten Rules of Management). Posted on December 1, 2013, in Uncategorized and tagged 21st Century Leader, Active Listening, Bill Swanson, Integrity, Jamie Sprayregen, Jonathan Citrin, Kenneth Chenault, Kim Jeffery, Sam Palmisano, Situational Value System. Bookmark the permalink. 1 Comment.